"They whom we love and lose are no longer where they were before. They are now... wherever we are." This memorial "stone" is a lovely reminder of a loved one who now lives in our hearts. 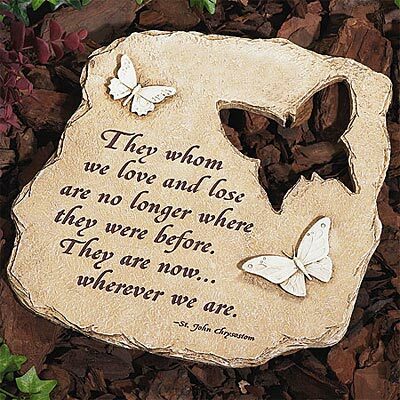 Garden stone is made to resemble real stone with an etched memorial verse and cutout butterfly. A thoughtful memorial gift selection for an indoor or outdoor space. Measures: 10.25 (L) x 10" (W). Made of resin. Hanger for indoor or outdoor display.